ABOVE: Need local currency? Head for the nearest "bancomat," "cashpoint," or other ATM machine. Cash is the fuel that drives your vacation, and it comes in many different flavors. The simplest way to obtain local currency abroad is by using an ATM or automated teller machine. An ATM will normally give you a better exchange rate than you'd get if you were buying foreign currency with cash or traveler's checks, since the exchange is made at the interbank wholesale rate. But watch out--some banks are now charging "conversion fees" on top of the interbank commission. 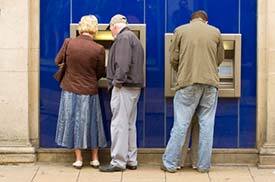 See our ATM Conversion Fees article for details. Europe was slower than the U.S. and Canada to join the ATM bandwagon, but today you'll find ATMs nearly everywhere you look in Western Europe (and in much of Eastern Europe as well). The names may vary--"Bancomat" is popular in Italy, for example--but the machines are easy to recognize. Just as important, many European ATMs have instructions in several languages to make life easier for the tourist. Have the right kind of PIN. MasterCard/Cirrus recommends a four-digit PIN (personal identification number) for use with ATMs in its European network. The Visa/Plus network accepts four- to six-digit PINs. Your pin should be numeric, not alphanumeric--e.g., "1245," not "ab12." If necessary, ask your bank to change your PIN or translate it into numbers before you leave home. Don't change small sums. Most banks charge a flat fee for each ATM transaction outside their own networks. (For example, one of our banks charges US $3 for each withdrawal from a "foreign" machine at home or abroad.) If a withdrawal of 50 euros costs as much as a 300-euro transaction, it makes sense to get the higher amount--assuming, of course, that you have a safe place for the extra cash and will be in the country long enough to spend it. Notify your bank before leaving home. Some banks block overseas transactions to prevent fraud unless they've been notified of the cardholder's travel plans. Bring along cash. A modest supply of cash is nice to have if the ATM link to your home bank isn't working. (Carry the money in a safe place, such as a zippered "neck vault" or a money belt). Be prepared for surprises. Reader John Koeller reports that the MasterCard/Cirrus ATM Locator showed machines in Slovenia, but those ATMs wouldn't dispense cash to non-Slovenians at the time of his visit. Having a stash of banknotes and a credit card could save the day if you can't find a friendly ATM. Expect talking ATMs soon! Reader Mark Rothschild filed this report after a recent trip to Japan: "ATMs in most 7-11 convenience stores and many post offices 'speak' foreign languages, especially English. Also, Citibank has been a reliable source of English-speaking ATMs for some time now." Photo copyright © Jilliam J. Murphy.